You are jumping on a trampoline and as you are floating in the air for those few seconds defying gravity you wonder, "how high could I possibly jump? What could possibly make me jump higher?" You are not given the chance to think any further that your body is already following the traditional law of physics by which heavy bodies subjected to the force of gravity are bounded to be stuck on the surface of the Earth, and immediately after, your magic trampoline pushes you up again and the disillusion of flying starts all over again and as the trampoline allows you to re-experience the beauty of levity you try and jump higher and higher, knowing that unluckily it won’t last forever. There is probably beauty in the motion of jumping and particularly in that short aerial phase where your reality changes just to fall back into place few instants later. Is that why people enjoy trampolines so much? Is it because it gives us the taste of an experience we are not allowed to really own to its fullest and, hence, we long it? Probably, yes, but today we are trying to uncover the mystery behind jumping high on a trampoline. 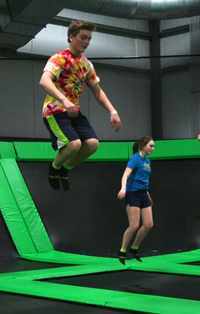 After reading this article you will get to know how to jump higher on a trampoline and more interesting facts like the highest trampoline jump ever. Are you ready to push yourself to new heights? We guess you are. How high can you jump on a trampoline? No one can tell with absolute certainty what the average trampoline jump height is. However, beginners can easily found themselves jumping 16'5 high. This may sound like it is an unimaginable height to push your body to, right? But if jumping thrills you, if the idea of overcoming your limits challenges you then you will realize that 16ft is certainly not impossible to achieve. A beginner adult, as a matter of fact, can get to this height with no sweat. A trampoline, however, can propel your body so much higher. This is the reason why for trampolines located indoors there are international rules regarding the minimum height of the ceiling. 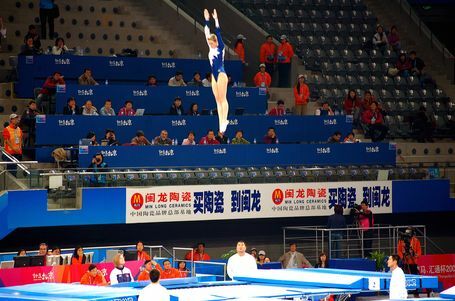 This is especially true in indoor facilities used for competitions where athletes and professional trampoline users are able to reach even higher heights. Jumping on a trampoline is easy. Have you ever jumped on the ground? If yes, then you know exactly how jumping on a trampoline should look and feel like. You rely on the power coming from the upward motion of your body pushed by the explosiveness in your legs. Your feet will initiate the movement. Then as you are about to lose contact with the ground simultaneously swing your arms up to help you jump higher. This should be a coordinated movement, a wrong timing would definitely make your jump look awkward. But on a trampoline, you might want to think about what happens next as you land on the bouncy net. Depending on what you want to achieve, you should keep your knees slightly bent if you want to keep jumping, whereas to interrupt the momentum of the jumps you should instead make sure that your knees are even more bent so that as you land repeatedly you lose momentum and eventually you’ll stop altogether. To answer this question you might need to have some background knowledge in physics. The potential height you can reach with a trampoline depends on several factors, like the number of springs, the stiffness of the spring, the elastic component of the net, not to mention the weight and height of the person jumping on the trampoline. But basically, this is how it physically works. You should consider the trampoline as a system storing potential elastic energy which depends on how much the net of the trampoline can stretch downwards. As you jump on the trampoline you accumulate a certain amount of speed that the moment you land on the trampoline is absorbed equally by the net and the springs which, in turn, will be converted to a proportional kinetic energy that the trampoline itself is going to transfer to the person jumping allowing him to make the next jump. Jumping at an increasing speed and achieving higher jumps gives your body an increased potential energy, which is dependent on the position of the person with respect to the system of the trampoline, meaning that if you land from a higher spot you will technically be able to jump higher thanks to the response of the springs and net to the energy accumulated by your potential energy. Simply put the trampoline gives you back what you put in with a little of interests: the elastic component. If jump from the center of the trampoline, moreover, you will benefit from a more powerful push since the system- net and springs- are designed to be perfectly balanced. Jumping from a random corner won’t have the same propulsion force since the net and the springs won’t contribute equally. Professional, experienced athletes can get up to 30ft in height. Isn’t that crazy? But you will be surprised at what people do to jump really high on a trampoline. There are several of world records based on the modality of the jump, whether it was just one person jumping or one person jumping aided by the momentum of others jumping with him at the same time or the height from which the person lands in order to get the bounce. So back to the question, what’s the highest jump onto a trampoline? In terms of height, the only world record certified was not attempted individually, but rather it was a team jump. In 2014, three brothers, Eric, TJ and Sean Kennedy at the Rockefeller Plaza﻿ in New York improved their own record to 22’1. Sean performed the jumps as the two other brothers propelled him. There are even more hilarious world records set on trampolines that you should definitely check out if you are curious. The trampoline is clearly designed to help you in the upward motion of your body. 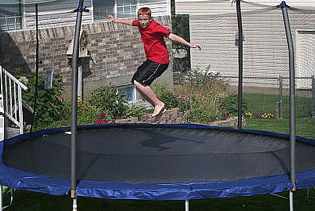 And as you jump the trampoline keeps the momentum going by pushing your body repeatedly. But there is no magic trick on how to bounce higher on a trampoline. The heights you can reach depend also on your abilities. As a matter of fact, the first jumps is initiated solely by your legs, after which the exchange of kinetic energy occurs between you and the trampoline. Pushing harder on the trampoline would mean that you are giving more force to the trampoline which will return more force to you for the next jump. As you land on the net you should push harder on it if you want to jump higher. You will see that the trampoline really has your back and will push you as high as you want to go, of course, you won’t reach the sky, but you got the idea. If you want to jump higher, you should train your body to do so. Your legs should be stronger and more explosive but it is not all about power. Sometimes, you might have felt like you couldn’t control your body while in the air and you got a little bit scared. Jumping at higher height requires you to be in control of your body completely. This is why, in addition to your leg routines you should also make sure that you work on your overall core stability, with exercises designed to improve your abs, back, and torso. As your body improves, you will notice that jumping on a trampoline will become easier and jumping higher will be a breeze. By now you should know mostly everything about how to jump higher on a trampoline, the next thing you might want to do is put yourself out there and challenge yourself. In a complete safety environment, and whenever you feel like jumping higher just trust your body and do it. Your body can achieve whatever your mind wants. 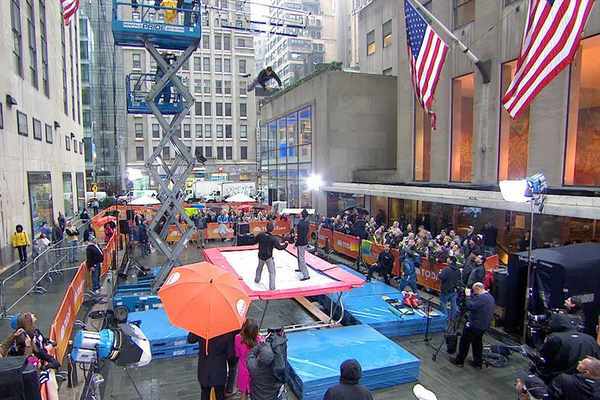 You never know, you might be the next person to make the highest trampoline jump ever. But you will never know until you try.